Once upon a time, a rich merchant lived with his daughter. He loved the girl for her beautiful face and her sweet heart. But after his wife died, he decided to marry a second time, and his new wife was selfish and cruel. She had two daughters of her own who were just like her. . . . This story of Cinderella is based on the version collected and published by the seventeenth-century author Charles Perrault. Perrault’s Cinderella echoes the elegance and luxury of the French court of King Louis XIV, and it’s from his version that we get Cinderella’s famous glass slippers. 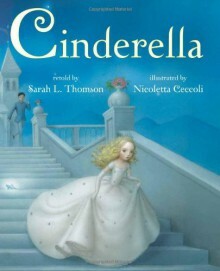 Sarah L. Thomson’s beautiful retelling of the classic fairy tale is matched with the uniquely stunning artwork of Nicoletta Ceccoli rendered in acrylics on paper and digitally. This is a picture book to treasure.